After sanding and sealing guitar body I applied 6 coats of primer over 2 days followed by 7 coats of colour which I cut back slightly every second coat. I'm using nitro cellulose paint to get a vintage look and feel, plus its rather forgiving of heavy handed idiots...me! Next up is the varnish and then a month to harden off before sanding and polishing, plenty to do in the meanwhile though. 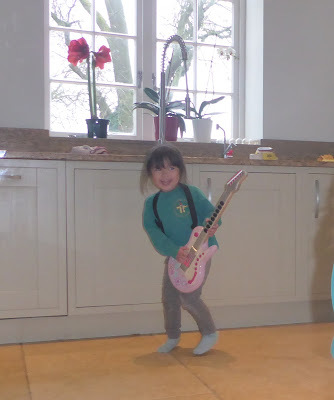 My littlest has enjoyed watching me work and has decided to show off her shredding talents at all opportunities......apptly she loves playing along to The Ramones 'I wanna be sedated' a message perhaps? How long do you think from start to finish? Nitro - best finish ever. The guitar will age properly and wear in rather than wear out. Now that kid has got right stance but can she sing ? She has great taste in music!